How does TidyTabs impact performance? TidyTabs has been designed in a way that it have nearly no impact on performance, even on slow computers. 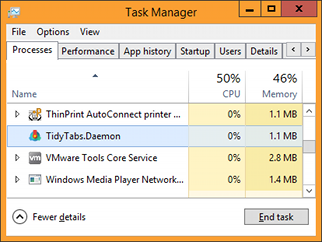 You can check by yourself, TidyTabs uses approximately 4 Mo of RAM and 0% of CPU.